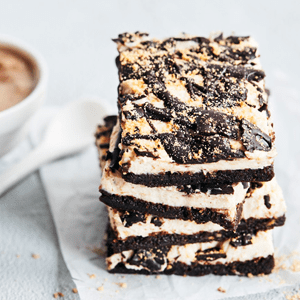 If it’s chocolatey, marshmallow, and Graham cracker s’mores you crave, make a batch of these No-Bake S’mores Bars. 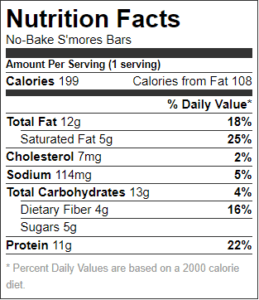 We think they’re even better than the real thing because they contain all of the essential flavors of a classic toasty s’more — made healthy. Bonus: No campfire is needed to enjoy these delicious treats. Rather than incorporate marshmallows (since those are made mostly of refined sugar) these sweet treats get their toasty marshmallow essence from a few drops of optional marshmallow flavor (pure vanilla extract is a good substitute). 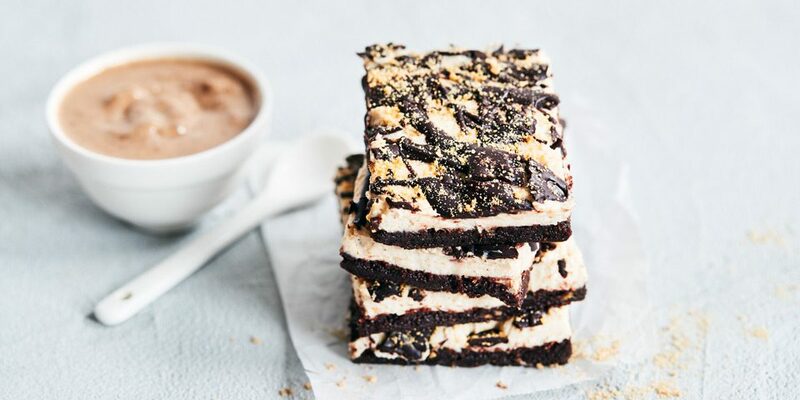 No extra sugar required for these s’mores bars, creamy Vanilla Shakeology mixed with ricotta makes up the white “marshmallow” cream, and Chocolate Shakeology forms the brownie-like base and crunchy chocolate topping. To top them off, real whole wheat Graham crackers achieve a truly authentic taste. 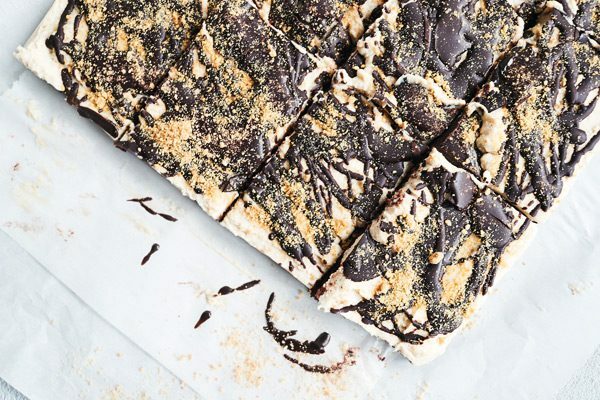 Whether you whip up a batch as a part of your weekly meal prep or are just catering to your inner child, these s’mores bars one satisfying snack. Place graham crackers in food processor (or blender); process continuously until crackers are crushed into fine crumbs. Set aside. Line an 8 x 8-inch pan with plastic wrap (or aluminum foil). Evenly sprinkle ⅓ of graham cracker crumbs in bottom of pan. Set aside. Combine banana, almond butter, cocoa powder, 2 scoops Chocolate Shakeology, and ⅓ of graham cracker crumbs in a medium bowl; mix well with clean hands or a rubber spatula. Press chocolate mixture into prepared pan. Cover with plastic wrap and press down to flatten into pan. Refrigerate for 1 hour to set. Place cheese, Vanilla Shakeology, and marshmallow flavor in food processor (or blender); process until smooth and well blended. Evenly spread cheese mixture over chocolate mixture. Set aside. Combine remaining 2 scoops Chocolate Shakeology and oil in a small bowl; mix until smooth. Evenly spread Chocolate Shakeology mixture over cheese mixture. Sprinkle top with remaining ⅓ of graham cracker crumbs. Lightly press graham cracker crumbs into top. Refrigerate for 1 hour, or until set. Cut into twelve bars (approx. 2½ x 2-inches). You can find marshmallow flavor on-line or in specialty cake decorating stores. You can substitute pure vanilla extract for marshmallow flavor.